This miniature tea set and wine goblet are made from acorns. With a few adaptations the pot, goblet and cup could also be made from other small round nuts including hazlenuts (filberts). The set as shown here is in roughly 1:24 scale and fits with other woodsy projects for fairies or the poseable miniature mouse. In a slightly larger scale you can have a teapot which will pour water. The ability to pour depends on the diameter of tubing used for the teapot spout. If you cannot find actual acorns or nuts suitable for the pot and cup, similar items can be made from small foam filled glass christmas / floral ornaments, like the "berries" used for the acorn reading lamp. Acorns - choose acorns, hazlenuts or other items a suitable size for the miniature scale you are working in. Brass Tubing - this is not essential, you can make a non pouring spout from wire if you choose. For the 1:24 scale teapot I used 1/16 inch (1.6 mm) tubing, use larger tubing for larger scale pots. Awl or pointed toothpick or darning needle. Craft Wire - preferably wrapped with paper or florist's tape. I used 26 gauge paper wrapped wire for this project. Scraps of stems from wired floral ornaments will work as well. Pliers - to bend the brass tubing. Wire Cutters preferably a nipper type which can be rolled around the brass tubing to cut it as well. Bent Nose Tweezers - useful for holding the small parts as you glue. 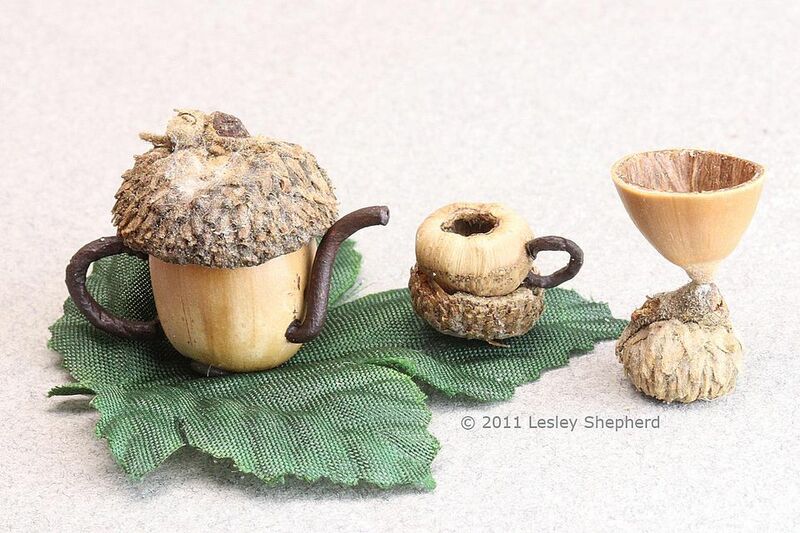 Begin by choosing acorns suitable sizes for the teapot and cup. Set aside the caps, hopefully the cap of the acorn used for the teapot will work for a teapot lid, and the cap from the smaller acorn used for a teacup will work for the teacup saucer. Have a wide assortment of different sized acorns in case this won't work. If you are using hazlenuts or other nuts you can skip this step. Sand the flattest end of your nut to form the base of your teapot and teacup. For the teapot I sanded the end of the nut from which I had removed the cap. When your nut will stand upright you have sanded enough. Don't sand too much, acorns are very thin skinned. Use your razor saw and miter box to cut the pointed end of your teapot acorn of square with the base, to leave a section the size you want your teapot body to be, but slightly taller to fit under the cap. If you are using a hazlenut, you may need to make a cap from the section you saw off, so cut it off square with the bottom. Use an awl, pointed toothpick or darning needle to winkle the nut meat from inside the acorn. For the cup, you may not need to cut off the pointed end of hte acorn, small acorns are often very flat. Check to see if you can hollow out the acorn once the cap is removed by poking gently through the uppern end with an awl. If that doesn't work, or if your acorn is too pointed, you may need to sand off the pointed end, then clear the contents of the nut to make a hollow cup. To make handles for the acorn teapot and teacup, bend a section of paper coated wire to a suitable shape, while still attached to a longer length of wire, and paint the handle section brown. Using a longer length of wire than you need will make the handles easier to handle and paint. When painted they should resemble twigs or vines. Set the handles aside to dry. To shape the brass tubing for the spout of the miniature teapot, hold the tubing firmly in a pair of pliers (beading pliers or needlenose pliers work best) and gently bend the tubing into a rough S curve suitable for the tea pot spout. Hold the tubing up against the acorn from time to time to check the size and shape will be correct. Don't bend the tubing too abruptly or it will kink and may break. As shown, the tubing can be used with a short or a longer spout stem as you will see in later photos. When you have the tubing shaped correctly, roll the tubing gently between the jaws of a pair of wire nippers to score the bent tubing at the point where you want to cut it free from the main tube. Gently increase the pressure on the nippers as you roll the tubing between them, cutting the tubing without crushing it. Use a mini drill to drill a hole at the base of the front of the teapot where you will insert the brass spout. You will need a drill roughly the same diameter as your brass tubing. Be careful not to put too much pressure on the acorn or you may shatter it. Use a sharp drill bit! Test fit the spout gently twisting it to fit it into the base of the acorn. As you can see, I decided my teapot looked better with the spout reversed from my original plan. When you are sure it will fit, remove it and drill holes on the opposite side of the acorn to fit the wire handle. Check the diameter of your wire against the diameter of your drill bit on a flat surface to make sure you are drilling the correct size hole. You can leave the spout with a brass finish, or paint it to match the handle using acrylic paint. Paint the spout before you glue it permanently into place. Fit the spout into the hole you drilled in the teapot so the spout is slightly inside the wall of the pot, and use a toothpick or scrap of paper to apply a generous bead of glue around the base of the spout on the inside of the nut. Avoid getting glue into the tubing. Hold the spout in place or prop it in place using modelling clay until the glue dries. The weight of the spout will cause the teapot to tip over otherwise. Insert the teapot handle in the holes you drilled across from the spout and glue the handles to the inside wall of the teapot. Leave to dry. With any luck your teapot will balance, but you may need to adjust the handle, or the length of the teapot, or add a few tiny fishing weights to the inside of the teapot to keep it balanced, depending on the size of your handle and how you wish to display the pot. Attach the handle to the teacup / coffee cup the same way you did to the teapot. Set aside to dry. When the handles and spout are secure on your tea set parts, test fit acorn caps to the top of the teapot and underneath the teacup. You will need to sand the top of the cap you want to use for a saucer, and you may need to sand the edges of the cap as well so your teacup handle will not tip the teacup when it sits in the saucer. Experiment until you get a cap that fits correctly. The cap you removed from the body of the teapot or the teacup may not work as a final lid or saucer. If you made your teapot from a different type of nut, try using the section you cut to open the nut as a lid for your teapot. Add a bead for a lid handle, and glue a small section of card or paper inside the piece of nut to act as a lip to hold the lid over the opening. To assemble wine goblets, use sections of the pointed end of nuts glued to acorn caps or reversed sections of the broad end of the nut. Experiment and see how creative you can be. If you have difficulty gluing the narrow stem sections together, sand the pointed ends so you have a broader cross section to glue, or drill a hole the size of a piece of wire in the goblet base and stem, and insert a section of wire to stabilize the join.